Wild rice is grown in shallow water in small lakes and slow-flowing streams. Northern wild rice (the type I find in my area) is an annual plant native to the Great Lakes region of North America. 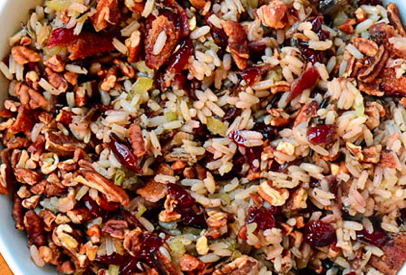 Wild rice is the official state grain of Minnesota – Woo! It is almost always sold as a dried whole grain, is high in protein, the amino acid lysine and dietary fiber, and low in fat. It is also a good source of certain minerals and B vitamins. To cook wild rice, always start by rinsing well to clean off any dirt that may still adhere to the grain. To cook on the stove top, bring 3 cups water or stock to a boil, stir in 1 cup uncooked wild rice reduce heat and simmer, covered 40-45 minutes or just until kernels puff open. Uncover and fluff with a fork and simmer an additional five minutes. Drain off any excess liquid. To cook by baking in the oven, in a 2-quart casserole, pour 3 cups water or stock over 1 cup wild rice. Cover and bake at 350º F for 1 hour. Fluff with a fork and continue baking for 1/2 hour. Drain any excess liquid. Fluff with fork and season to taste. Drain off any excess liquid. One of my favorite recipes using wild rice is Chicken (or turkey) Wild Rice Soup. Yum! Preheat oven to 375 degrees. Place sweet potato cubes onto a baking sheet and toss with olive oil, salt and garlic. Roast 30-35 minutes, turning once with a spatula, or until potatoes are cooked through and begin to brown. Remove from oven then set aside (this can be done a day ahead). In a large mixing bowl, combine sweet potatoes, pecans, wild rice, carrots, celery, cranberries and onion. Stir to mix well. Sprinkle vinegar, olive oil, soy sauce, orange peel and black pepper over salad mixture and stir so that salad absorbs dressing. Serve at once, or chill and serve later.